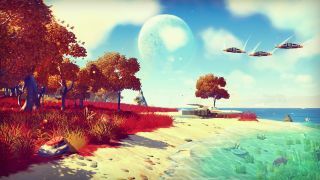 We knew that the universe of No Man's Sky was going to be big. Really big. But not this big. An interview by MIT Technology Review has shed some more light on procedurally-generated PS4 game, which, quite frankly, makes Minecraft look like amateur hour. One particularly mind-blowing reveal was that, due to the game's unprecedented scale, the development team have had to fire automated bots out into space to take and return screenshots of distant planets. "No game has made it possible to fly down to a planet, and for it to be planet-sized, and feature life, ecology, lakes, caves, waterfalls, and canyons, then seamlessly fly up through the stratosphere and take to space again. It's a tremendous challenge," said game creator Sean Murray. And if you still had any doubt over the expansiveness of Hello Games' E3-show-stealer, Murray added: "If you were to visit one virtual planet every second then our own sun will have died before you'd have seen them all." Our brains. Oh jeez, our brains.